Health care legislation remains unpopular | Virginia Right! Almost four months after the passage of major health care legislation, the law remains unpopular with the public. 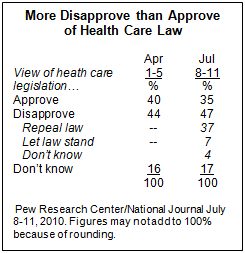 Nearly half of Americans (47%) disapprove of the health care law while just 35% approve of the measure. An overwhelming proportion of opponents of health care legislation – 37% of the public overall – favor repealing the legislation as soon as possible. Just 7% say they want to let the law stand and see how it works. Public opinion toward health care legislation remained very stable in the months leading up to the bill’s passage, and that has continued to be the case. Opinion about the legislation is somewhat more favorable among those younger than 30 than among older Americans; still, nearly as many young people disapprove (38%) as approve (40%) of the law. Among older age groups, opposition surpasses support by significant margins. While whites disapprove of the law by nearly two-to-one (55% to 29%), non-whites approve of the measure by roughly the same margin (52% to 28%). There also continues to be a wide partisan divide in opinions about health care legislation: Republicans disapprove of the law by about eight-to-one (82% to 10%) and fully 69% favor its repeal. Democrats approve of the legislation, but by a less lopsided margin (65% to 17%), and 12% say it should be repealed. Just 30% of independents approve of the law, while 52% disapprove; 37% of independents say the law should be repealed as soon as possible. More on the poll here.